Bus drivers can benefit from winter driving training. For teachers and administrators at school, winter safety is an important consideration. They need to keep in mind that children are not always aware of the dangers that can arise in winter months and work together to plan to keep the youngsters under their care safe. 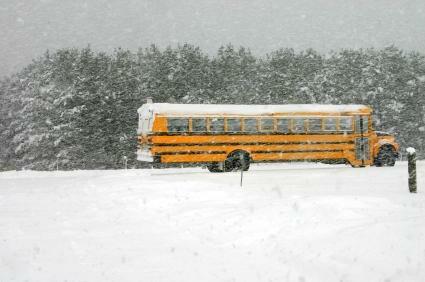 The time to devise a winter safety plan for the school is long before the colder weather hits. Take time to think about what procedures should be put in place in advance. Then make sure that staff, students, and parents are aware of the policies that will be adopted by way of a newsletter going home with all students. Severe weather warnings are broadcast on an as-needed basis. You can also get this valuable information from local radio and television stations. Part of the school winter safety plan will need to deal with school closings due to weather. If the school will need to remain closed on a regular school day, parents will need to be notified in some way. Arrangements can be made to broadcast an announcement on local radio stations and parents should be told which ones they should tune in to for this purpose. A plan also needs to be developed to handle early closings due to weather during school hours. How will parents be notified when students are going to be sent home early? Can students whose parents cannot be contacted remain at school until parents are reached? What special arrangements need to be made for students who are bussed to and from school? Bus drivers should be provided with specialized training to keep themselves and the students they are transporting safe during the winter. Icy roads mean that driving can be treacherous, and road conditions can change quickly. In cold months, you will need to take the air temperature and the wind chill factor into account when deciding whether children should be allowed outside at recess. Since many children live in families where both parents work outside of the home, they may be arriving at school early. When the colder weather comes, students should be allowed to go inside the school building earlier than usual. When the snow hits the ground, students are going to be tempted to play in it. While making snowmen and snow angels is a safe outdoor pastime, children should be reminded each year that throwing snowballs can be very dangerous. If a rock or a piece of ice should become mixed in with the snowball that is thrown at another person, it can cause serious injuries. Children should be reminded that snow is best left on the ground. School winter safety policies are designed to protect everyone on school property from injury. Consider the types of situations that you may need to deal with, and set policies to deal with them before they happen.